The mission of Meditate for Insight is to disseminate early Buddhist meditation principles and practices for greater happiness for people world wide. 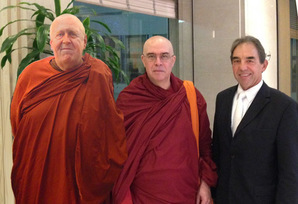 the programs offer through this website are dedicated to the memory of Venerable Sayadaw U Silananda (left), a Buddhist monk, scholar, meditation teacher, and Dharma friend who inspired and encouraged his students and supporters to endeavor toward the goal of greater self-knowledge, mental purity, and unbounded happiness. Scott A. Jordan, a Vietnam veteran, began his lifelong practices of yoga and mindfulness meditation in 1970. 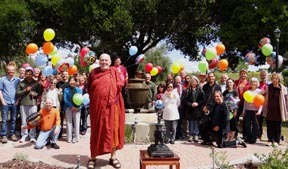 After graduating from Florida State University, he moved to Los Angeles where he studied Soto Zen Buddhism and Vipassana with Ruth Dennison and Robert Hover. He received a California State Teaching Credential in 1977 and taught hatha yoga at Cañada College and regional community centers. He continued meditation studies with Shri Munindra-Ji, Joseph Goldstein, and other leading meditation teachers. In 1978 he became a founding board member of the Theravada Buddhist Society of America where he studied Buddhist psychology, meditation, and the Pali with the Venerable Sayadaw U Silananda, until his passing in 2005. In his travels, Jordan studied yoga and Buddhism in India, trekked the Himalayas, and lived several years in the Middle East. He is a certified-registered yoga teacher and the former publisher of Polipoint Press in Sausalito. Jordan has been a lifelong political activist and an outspoken advocate for yoga and meditation practice as path to achieving sustainable health and happiness. He continues study and practice early Buddhism with Venerable Bhante Vimalaramsi, abbot of Dhamma Sukha Meditation Center along with Venerable Bhante Punnaji of the Buddhist Maha Vihara.